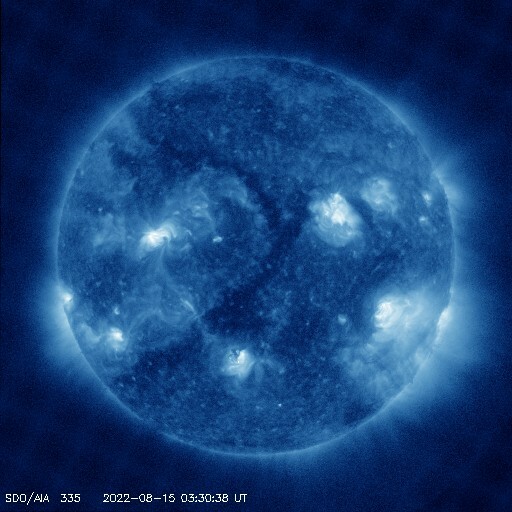 This is channel (as well as AIA 131) is designed to study solar flares. It measures extremely hot temperatures around 6 million Kelvin (10.8 million F). It can take images every 2 seconds (instead of 10) in a reduced field of view in order to look at flares in more detail. 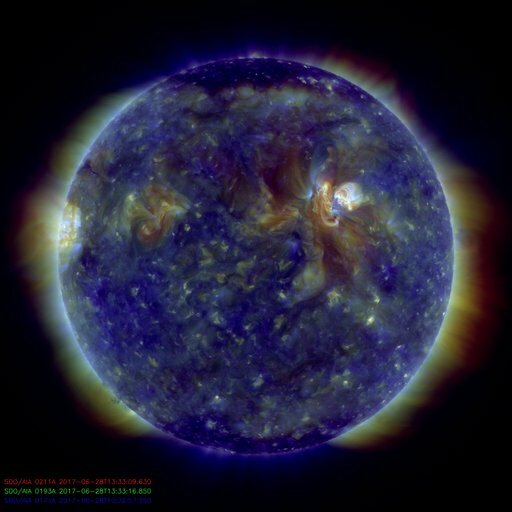 This channel (as well as AIA 94) is designed to study solar flares. It measures extremely hot temperatures around 10 million K (18 million F), as well as cool plasmas around 400,000 K (720,000 F). It can take images every 2 seconds (instead of 10) in a reduced field of view in order to look at flares in more detail. This channel is especially good at showing coronal loops - the arcs extending off of the Sun where plasma moves along magnetic field lines. 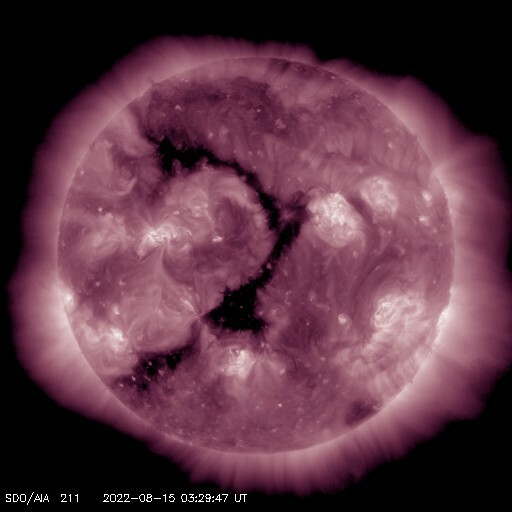 The brightest spots seen here are locations where the magnetic field near the surface is exceptionally strong. This channel highlights the outer atmosphere of the Sun - called the corona - as well as hot flare plasma. Hot active regions, solar flares, and coronal mass ejections will appear bright here. The dark areas - called coronal holes - are places where very little radiation is emitted, yet are the main source of solar wind particles. 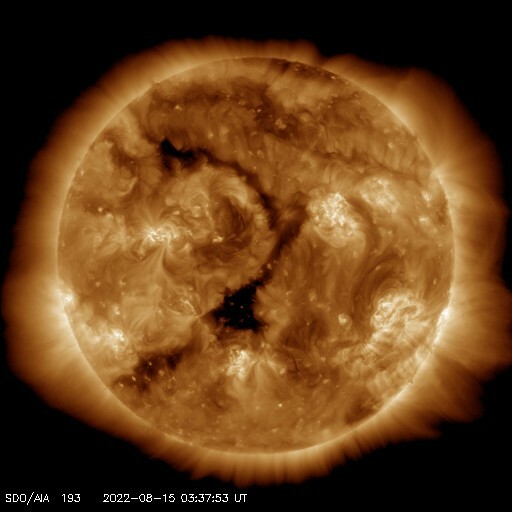 This channel (as well as AIA 335) highlights the active region of the outer atmosphere of the Sun - the corona. 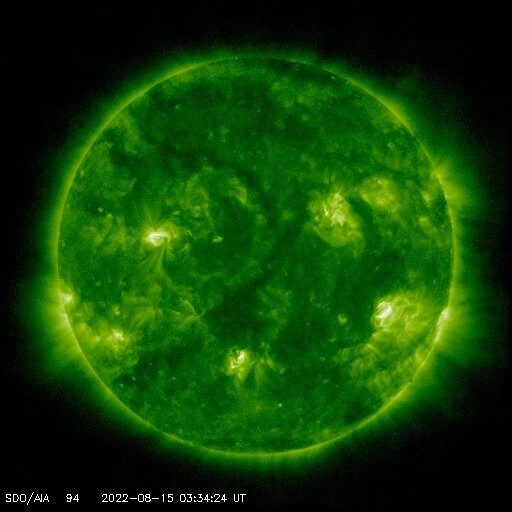 Active regions, solar flares, and coronal mass ejections will appear bright here. The dark areas - called coronal holes - are places where very little radiation is emitted, yet are the main source of solar wind particles. This channel is especially good at showing areas where cooler dense plumes of plasma (filaments and prominences) are located above the visible surface of the Sun. Many of these features either can\'t be seen or appear as dark lines in the other channels. The bright areas show places where the plasma has a high density. 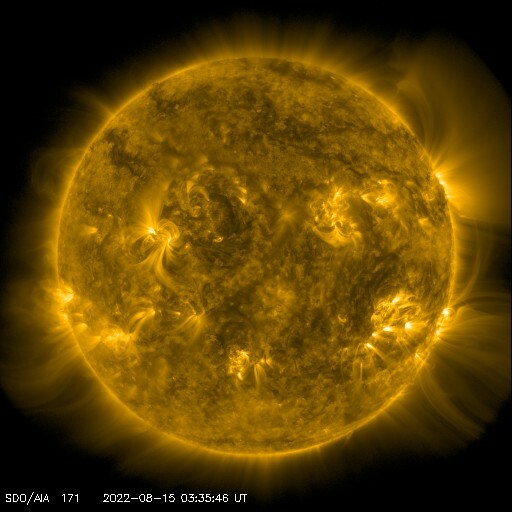 This channel (as well as AIA 211) highlights the active region of the outer atmosphere of the Sun - the corona. 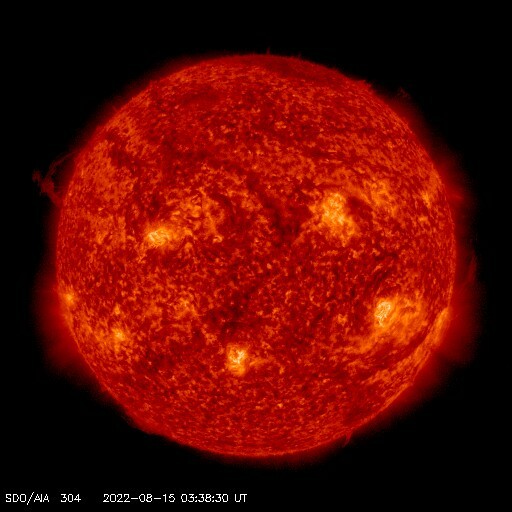 Active regions, solar flares, and coronal mass ejections will appear bright here. 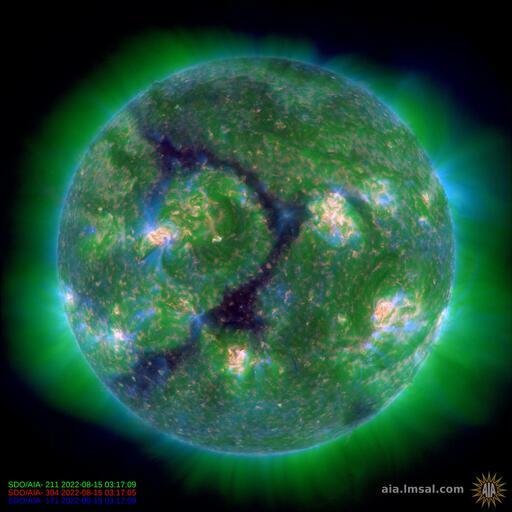 The dark areas - or coronal holes - are places where very little radiation is emitted, yet are the main source of solar wind particles. This channel shows the features that our eyes would see if we dim the Sun's intensely bright light. This wavelength of light is visible to people as blue-indigo, although here it is shown in yellow. 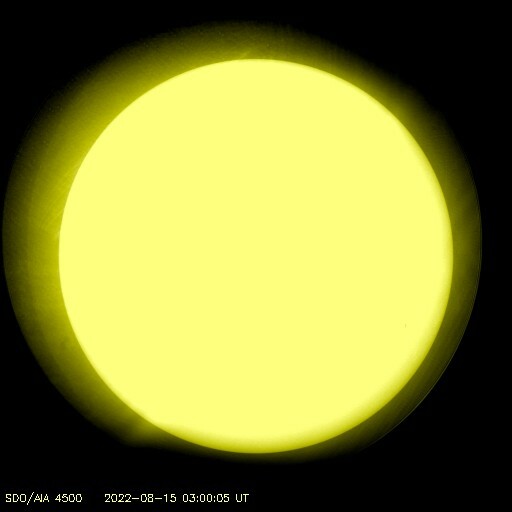 Sunspots stand out sharply here, and you can also see that the edge of the Sun appears darker a well-known effect called limb darkening. This image combines three images with different, but very similar, temperatures. The colors are assigned differently than in the single images. Here AIA 211 is red, AIA 193 is green, and AIA 171 is blue. Each highlights a different part of the corona. This image combines three images with different temperatures. Each image is assigned a color, and they are not the same used in the single images. Here AIA 094 is red, AIA 335 is green, and AIA 193 is blue. Each highlights a different part of the corona. This image combines three images with quite different temperatures. The colors are assigned differently than in the single images. 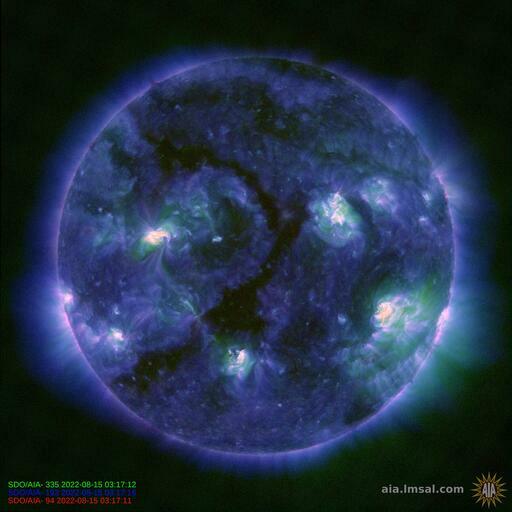 Here AIA 304 is red (showing the chromosphere), AIA 211 is green (corona), and AIA 171 is dark blue (corona).